One of the least used features on a multi-million dollar aircraft is its emergency slides. It’s a feature that no one ever wants to use but still must be tested on a regular basis so that when it does need to be put to use it will work. 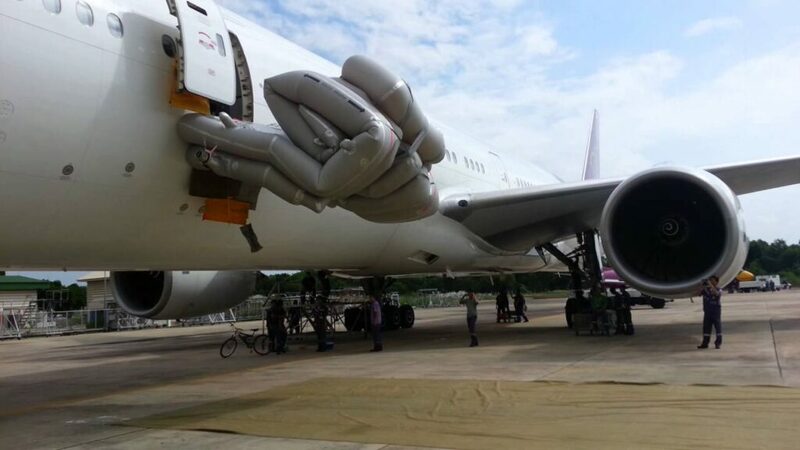 There are certain regulations that surround an emergency slide and one of those is how fast they need to inflate, especially if you were to make a water landing. Commercial aircraft are kept on a rigorous maintenance schedule as to keep the aircraft safe and performing to the best of its ability. Throughout its life an airplane will be tested and retested over its millions of components to make sure it keeps you safe. One thing that gets tested each time its taken in to the hanger is the emergency systems, this includes all of the inflight items such as fire extinguishers and oxygen masks. Most people don’t think however the slides are ever tested, but they are quite frequently. In order to make sure the emergency slide is in working order its deployed like it would be in a real emergency. The slide is inspected to make sure that it inflates within a certain time period and that the bottles that provide the inflation for the slides are working properly including the backup systems. When the slides are deployed they are looked over for signs of holes, tears, or unneeded wear and replaced if necessary. After deployment the workers need to fold up the slide in a specific sequence so that when it is deployed again it will smoothly deploy with no change of it getting stuck. Watching this in real life requires some hearing protection, the rate at which the slide is filled up moves the air so fast it creates a loud screeching sound. But even so you shouldn’t blink because in six seconds it is fully inflated and ready to be used if there was an actual emergency.